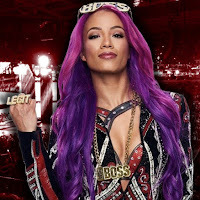 Sasha Banks spoke with Sky Sports about how she and Bayley would constantly ask Vince McMahon about giving the division the women's tag titles. Banks noted they just kept asking for most of last year until Vince finally gave it the okay. "It felt like the whole of last year we were asking, like we would be knocking on the door of Vince's office every week," Banks said. "Me and Bayley would go up to him and some weeks he'd say no and some weeks he'd say yes and then, bam, it's here. So that just proves that you should never give up on your dreams. If you're annoying enough you can make things happen and that's probably what happened, he just got annoyed with us." Bayley and Banks won the titles last February in an Elimination Chamber Tag Match that also featured Nia Jax & Tamina, The IIconics, Liv Morgan & Sarah Logan, Mandy Rose & Sarah Logan, and Carmella & Naomi. "I hope he understands how important this is to us and we're going to make it really special," Banks continued. "That's just Vince every week - you never know how he's going to be. You just have to keep on trying." Had an injury or something else cropped up before the Elimination Chamber match, Banks said she would have put the titles on Peyton Royce and Billie Kay. The two have teamed together since their NXT days, and Banks commented on how they've also dreamed of being tag champs long before they made it to WWE. "For me I would've said The IIconics, although they're still quite brand new," Banks replied. "They're amazing though, they're really incredible. And they've had the dream to be WWE tag-team champions since they were kids too. They seem like a real team too and if it wasn't us then I'd like to have seen them have it. Hopefully we can have some good matches with them."